See Victor D. Infante's author page. 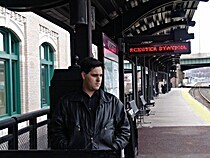 About meVictor D. Infante is an award-winning poet and journalist living in Worcester, MA. His writing has appeared in dozens of newspapers, magazines, journals and anthologies internationally, and his first full-length collection of poems, City of Insomnia, is available from Write Bloody Publishing. He is the author of several previous chapbooks of poetry, including Learning to Speak from FarStarFire Press, and The Price of Getting What You Want and God's Country from the Inevitable Press; and is the editor-in-chief of Radius, an online literary journal of political writing. He knows what you're up to, so stop it right now. Alas, I have no interest in swapping books or any of that. But I DO like seeing what other people are reading, especially when they're reading poetry from fine small presses.